These were jazz pundit Alan Musson’s words describing Interplay’s International Jazz Day gig with Claude Deppa and Three Way Split. Alan has reviewed the gig in SLAP (Supporting Local Artists and Performers), the multi-arts magazine based in Worcestershire. See the whole review here, or find it on page 29 of the June issue of SLAP. Interplay – 10 years together! Double bubble! Tony Kofi joins Alina Bzhezhinska for Interplay gig. Hosting on Interplay celebrates International Jazz Day – a moment to savour! 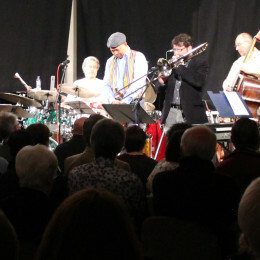 Adrian Litvinoff on Interplay celebrates International Jazz Day – a moment to savour!